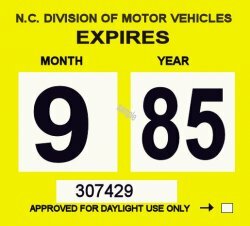 1985 North Carolina INSPECTION Sticker - $20.00 : Bob Hoyts Classic Inspection Stickers, Add a Final Touch to your Restoration! This beautiful 1985 North Carolina sticker was created and restored, both front and back, directly from an original. This sticker is under restoration, It will be finished shortly.